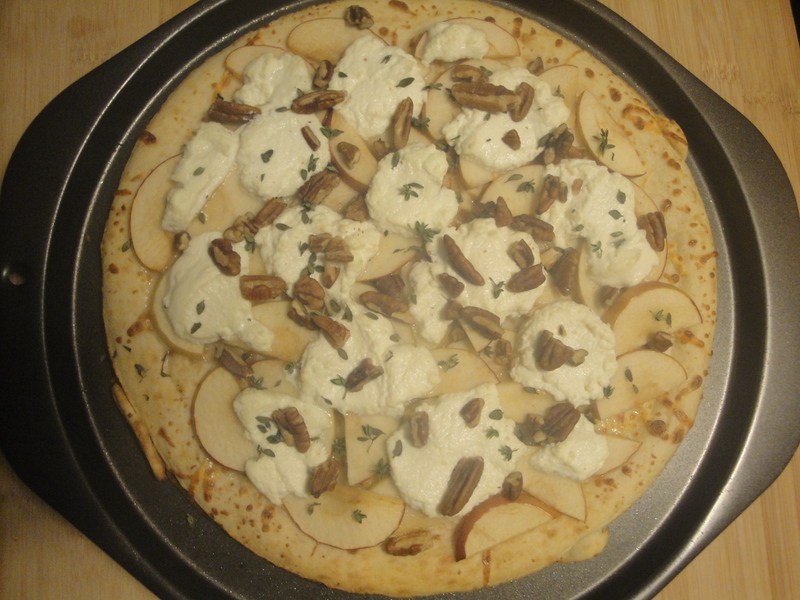 I admit I’m a basic, plain cheese pizza kind of girl and probably never would have tried this Apple, Ricotta Cheese, and Pecan Pizza if it weren’t for a restaurant in Philadelphia called Pizzeria Stella. Stella makes a pistachio pizza – yes pistachio! – and I kid you not, it is one of the best pizzas I’ve ever had and (gulp!) there isn’t a tomato anywhere in sight. Before trying the pistachio pizza, I might have ordinarily passed by a pizza with apple, pecans, and arugula but not this time. I have to say that I was pleasantly surprised by this. The original recipe called for goat cheese (which I think tastes the way a dirty sock might taste, bleh!) so I swapped that out for ricotta cheese. 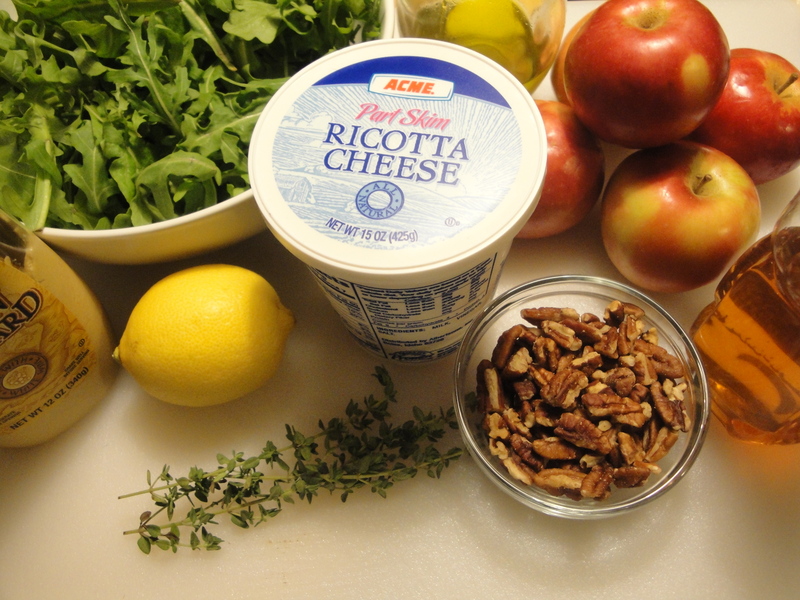 I like the contrasts in this pizza – smooth ricotta and crunchy pecans, sweet apples and bitter arugula – which help to keep the dish interesting. 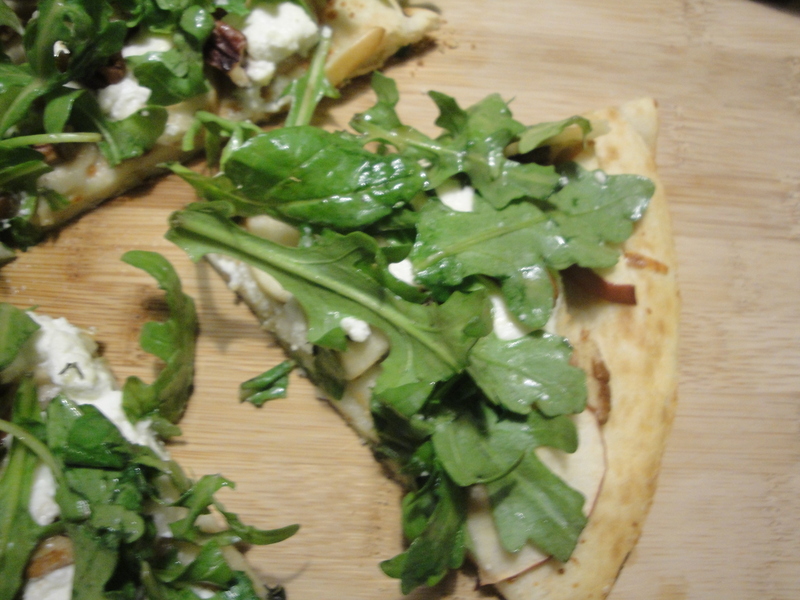 The honey-mustard dressing on the arugula provided an added tasty flavor to each bite. If you aren’t an arugula fan, I think you’d enjoy this even if you left it off but I’d recommend keeping the dressing. If you’re still not sure about this kind of pizza, I’ll tell you I wasn’t at all sure about a pistachio pizza either. Now…I dream about it. 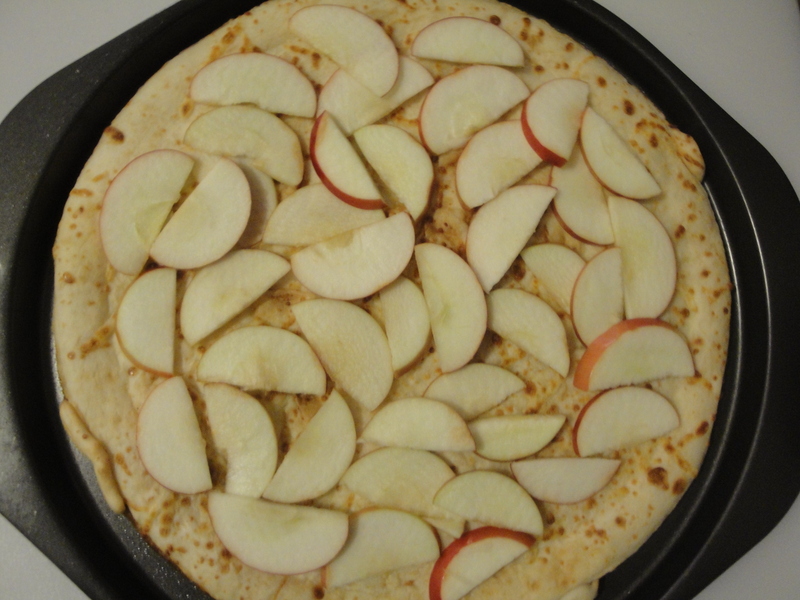 Arrange apple slices over the pizza crust. 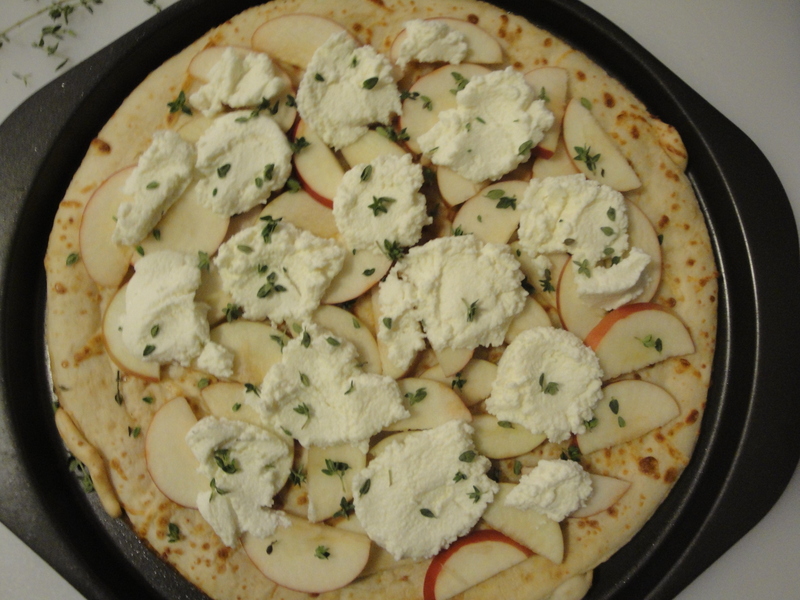 Top apples with ricotta cheese and fresh thyme. Bake for 8 minutes in a 450°F oven. After the pizza has cooked, top with pecans. 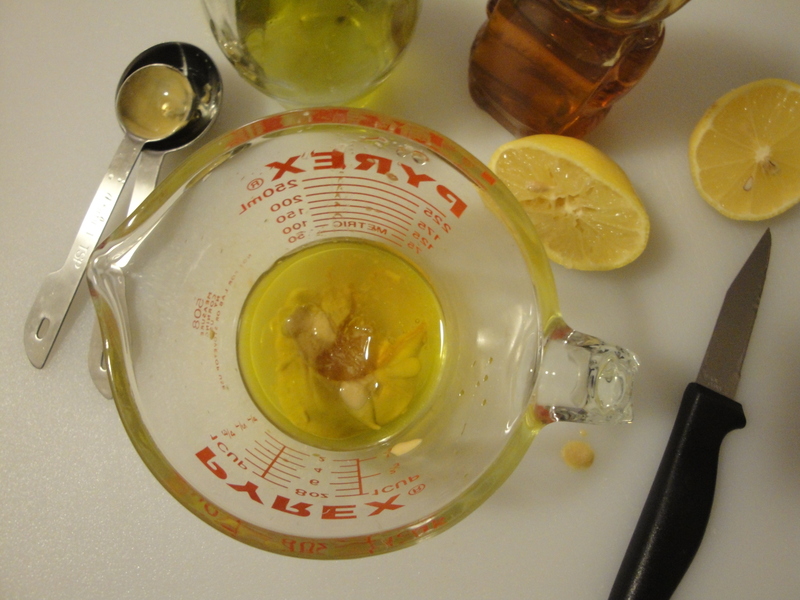 While the pizza bakes, prepare the dressing by mixing olive oil, dijon mustard, honey, and lemon juice. 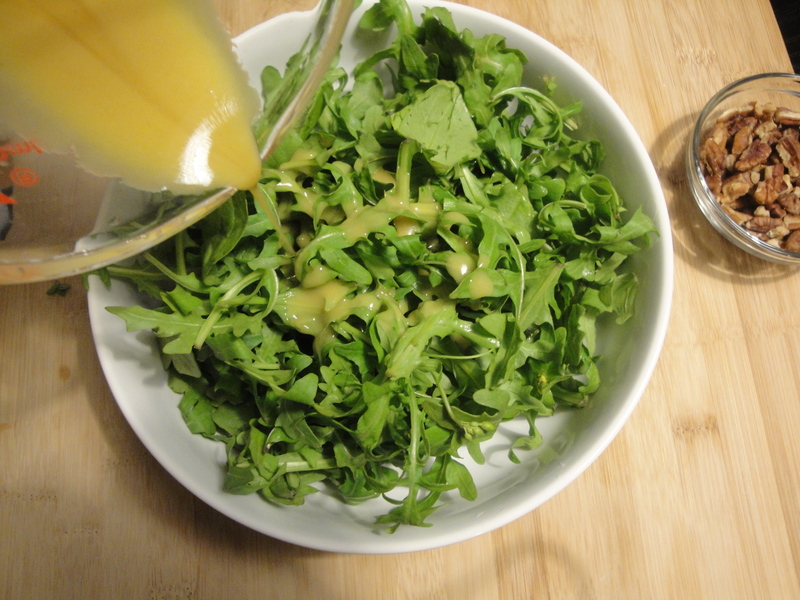 Pour the dressing over arugula and toss. 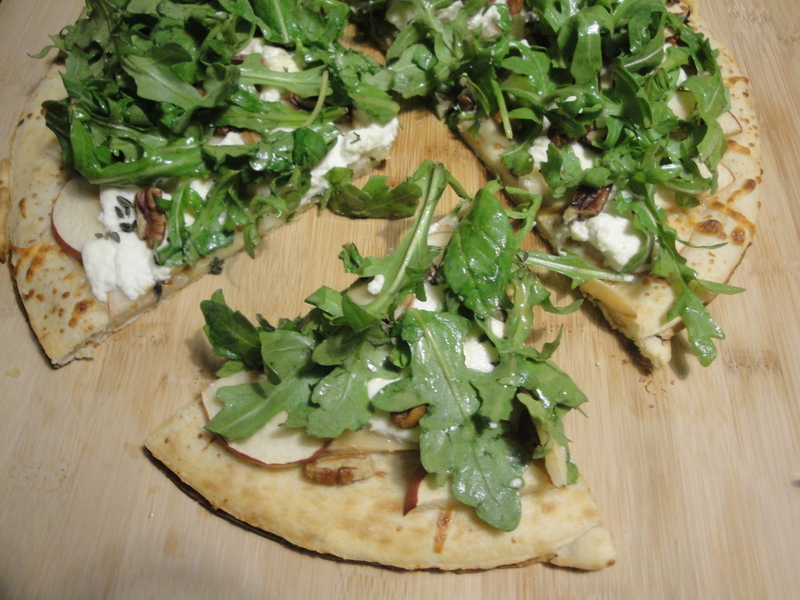 When pizza has finished baking, top it with the arugula salad. Slice and enjoy! Oh god, that looks amazing! And salivation-inducing! I would have to skip pecans (bf allergic), but I imagine some flaked almonds would work there as well, and mm… have to try this next time I make pizza!